All’s quiet on the European front, if stock traders are to be believed. 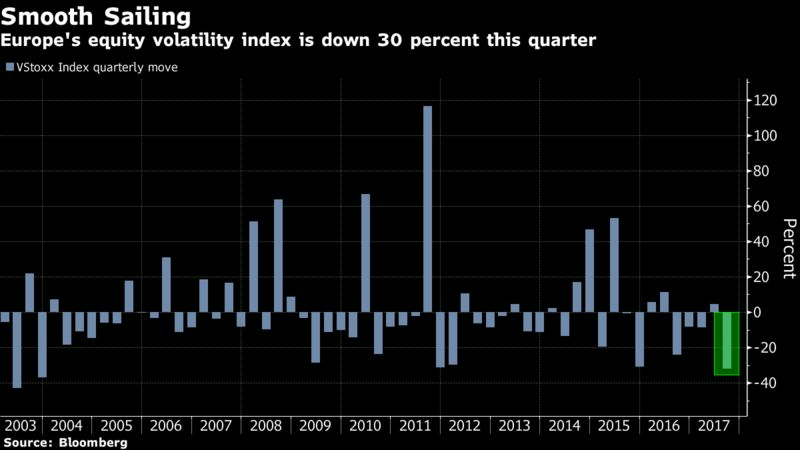 With Germany’s election — the fourth major one in the region this year — now out of the way, equity trading is the quietest since 2000 and a gauge of volatility hovering near a record low. Sentiment has been supported by steady economic growth and low interest rates, and strategists at banks including Goldman Sachs Group Inc. and Morgan Stanley say only a big shock will put an end to market resilience. Investors appear relaxed about risk again in what Barclays Plc has called an “uncomfortable” bull market, even with potential for disruption by everything from political turmoil in Spain and the U.K.’s messy Brexit negotiations to Italy’s upcoming vote next year. Funds tracking Europe have attracted some $33 billion in 2017, shaking off a short-lived panic over the extent to which a strengthening euro will hurt corporate profits. The evidence is there: the VStoxx Index is down 30 percent this quarter, while the cost of hedging European equities is the cheapest ever. That’s even after the Euro Stoxx 50 Index’s 31 percent rally since a low in June last year, which has sent valuations far above their long-term averages. All major national benchmarks in the region are up in 2017. To some, investor mood signals complacency. Strategists at HSBC Holdings Plc have been calling for a correction since early August, saying that traders are pricing in virtually no negative news. European stocks haven’t had a drop exceeding 10 percent in their latest 15-month bull run — one of the longest periods since the global financial crisis — as election results in France, Netherlands and now Germany have turned out to be benign. Angela Merkel on Sunday won her fourth term as German Chancellor, albeit with lower support for the country’s two main parties. While a drop in the euro helped lift the DAX Index on Monday, Spain’s IBEX 35 Index fell 0.6 percent after skirmishes between the central government and Catalan leaders continued over the weekend. Tension around Catalonia’s separatist referendum is a hazard that investors are still largely ignoring, according to HSBC. 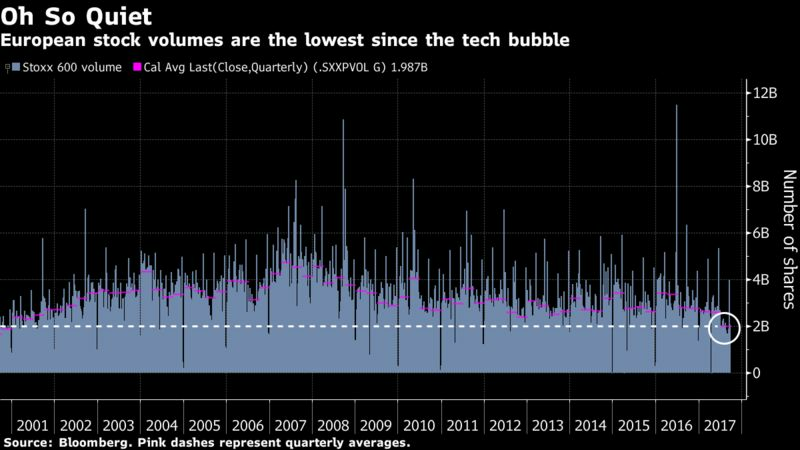 The average number of shares changing hands in Stoxx Europe 600 Index companies has been the lowest in 17 years this quarter, mirroring muted trading activity worldwide. This is because investors don’t hold strong views on the market either way and see no need to move allocations around, according to Morgan Stanley strategists. Market drivers are also shifting, with stock-specific news influencing prices 60 percent of the time, versus only 23 percent last year, they say. Is Dangote joining the bidding war for South African largest cement maker?